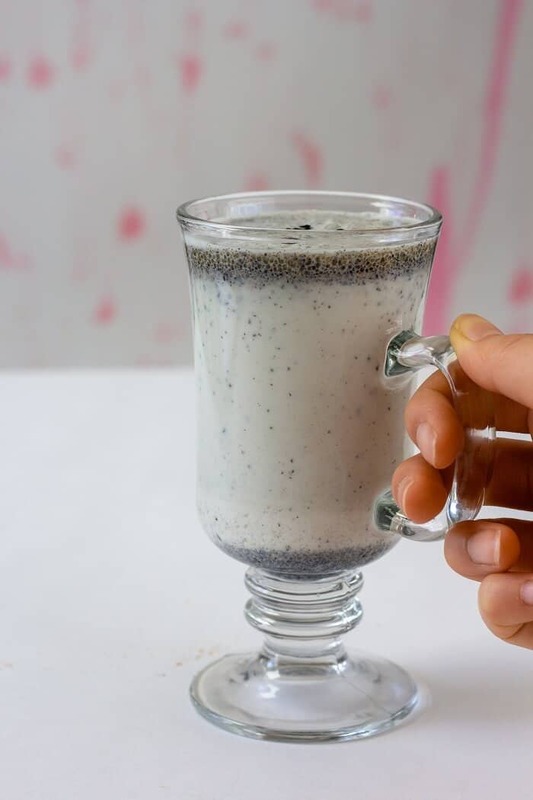 this black sesame latte has plenty of sesame (sesame seed powder, sesame oil, tahini), making it super nutty and perfect for sipping on a cool end of winter night! my body is not as forgiving of caffeine at night as it used to be. in college (this was less than a year ago so i’m not sure what changed so quickly), i could get away with drinking milk tea at 2am and not have insomnia or sleep maintenance problems. now? good luck. the first time it happened a few months ago, i saw the sunrise in new york (i’m not a morning person). the second time, i was awake at 3am even though i had to get up at 6:30am for work. 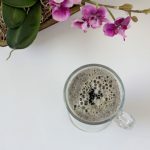 so i have to be careful about what i drink at night, and if i’m looking for something a little richer than a sleepytime tea latte, this sesame latte is perfect. perhaps this sesame latte is better described as a black sesame latte or a toasted sesame latte. the latte part is a bit of a misnomer too: there’s no coffee. i feel like sweet sesame milk is the best way to describe it, even if that doesn’t sound quite as luxurious as a toasted sesame latte. no matter what you call it, it’s a gently sweet, nutty, creamy drink that’s well-suited for when you need something cozy and non-caffeinated. you blend up a bunch of sesame (seeds, oil and tahini) with milk, half and half, tea and honey, then ta da! 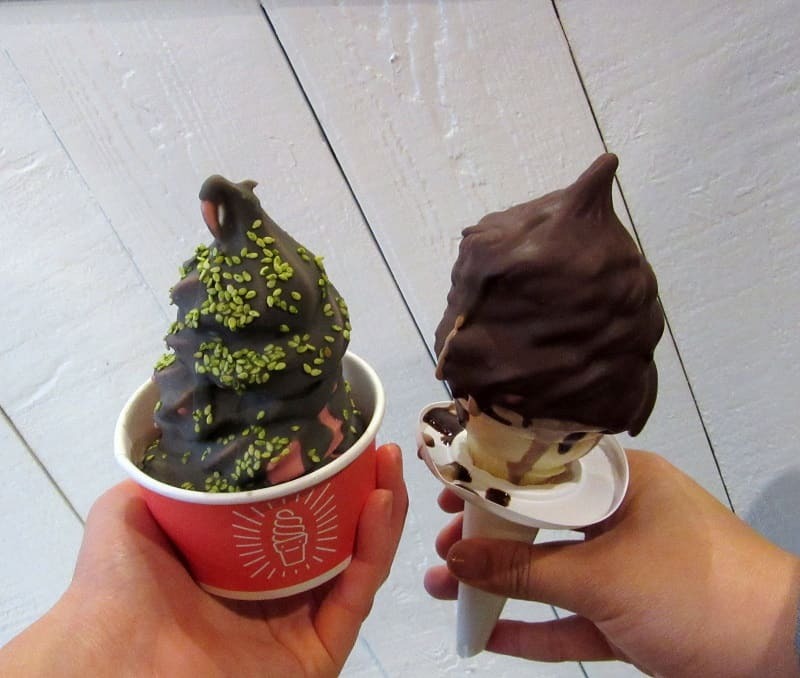 sesame latte for you and you and you. the tiny bit of half and half nudges the creaminess factor up a notch. and though it sounds counter intuitive, i like a hit of slightly bitter tea (decaf if 1/4 cup of plain black tea is too intense for you at night) to cut through all the milk and sesame. 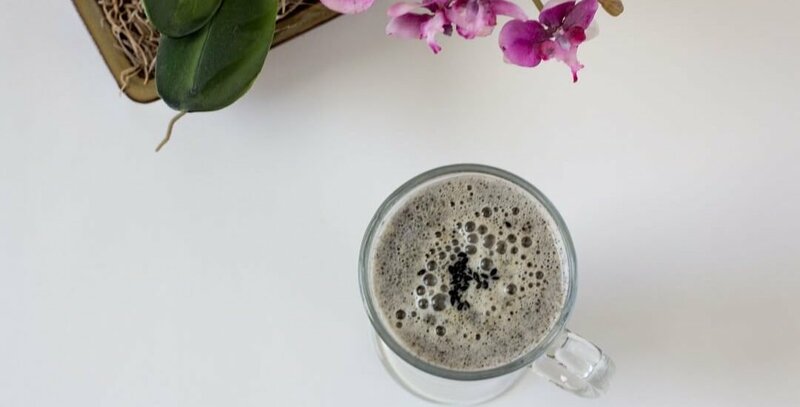 This black sesame latte is a nutty, creamy non-caffeinated drink perfect for cozying up to on a cool night! Toast the ground sesame seeds for 5-10 minutes, or until fragrant. You can do this on the stovetop in a skillet over medium-low heat or in the oven/toaster oven at 200F. Warm the milk slightly (30 seconds in a microwave is fine). In a blender, place the milk, tea, tahini, sesame oil, honey, half and half and salt. Blend for 15-30 seconds, or until combined. Pour into a glass, microwave for 1 minute, give it a stir and serve warm. To make the black sesame seed powder: grind 1/4 cup sesame seeds in a high speed blender (think a Vitamix). A 5-speed blender or Magic Bullet isn't powerful enough to grind the seeds fine enough, so I'd recommend trying to look for ground sesame seeds at an Asian market if you don't have a strong blender. Feel free to use a dollop of ice cream or sub in heavy cream if you don’t have half and half! You can skip blending the drink and mix everything together by hand - it won’t be as homeogenous but it will still taste great (and less dishes!). The sesame seeds will separate from the rest of the drink pretty quickly, but don’t worry. Stir/swirl it back together before you take a sip. Feel free to sub in soy milk, light coconut milk, oat milk, etc for the cows milk if you want to keep this vegan. You can also sub in some other kind of tea for the black tea- you're looking for something a little bitter to cut through the rest of the drink. I definitely can’t have caffeine too late at night either. 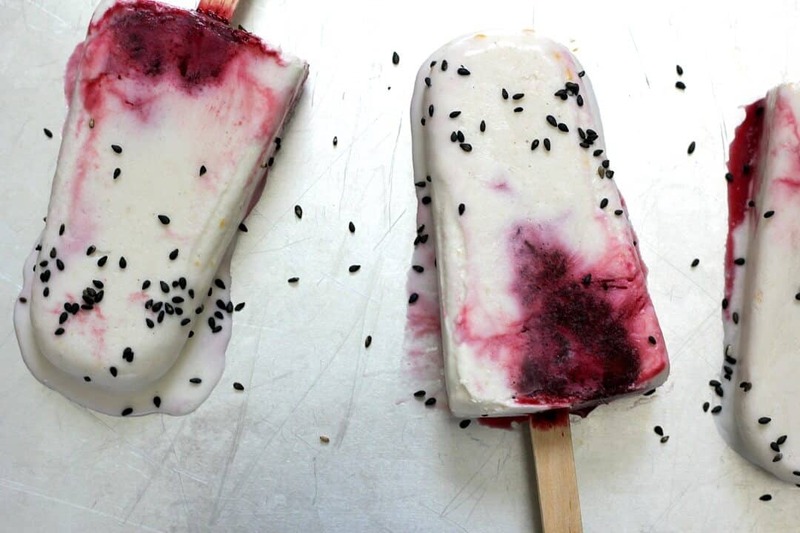 I soooo love sesame seeds so I’m definitely wanted a tall glass of this deliciousness! Heather, this looks and sounds so cozy. And, for me, caffeine after 2pm is pretty dangerous, so this looks like just what I need! it’s definitely kind of an esoteric latte, but fun if you happen to have everything at home! (or if you buy tahini for the purpose of making amazing homemade hummus, that works too haha). This latte screams my name, I’m making this tomorrow!!! Heather, this black sesame latte is intriguing! I try to eat as much black sesame as I can for it’s health benefits. This latte looks wonderful and delicious! I’ll have to try it! Perfect Recipe for the breakfast.I would try this for sure.Easy to made and so healthy to eat. I have never heard of this type of latte before but it sounds very satisfying. Coincidentally, I’ve been reading about the health benefits of black sesame and was wondering how to add it into my diet. Thanks, Heather! Oh man, I CAN FEEL YOU ABOUT DRINKING MILK TEA AT 2AM IN COLLEGE LOL. Maybe it is this whole work grind that is screwing us up or something.. 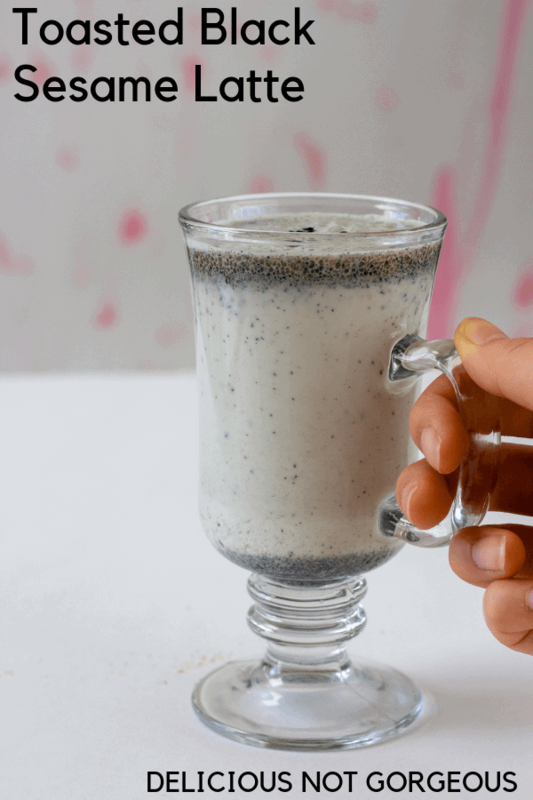 This toasted black sesame latte looks like an interesting recipe. As much as I love sesame (I abuse that), I never thought of blending it in a latte. Gotta give this a try! I have had this kind of latte before. I like to add a bit of coffee for more taste. Man, I wish I had found you when I was on a one-month caffeine detox…but better late than never! Going to try this! Like you, I too need to stay away from caffeine too late at night, so this would be perfect for me. Look so good!